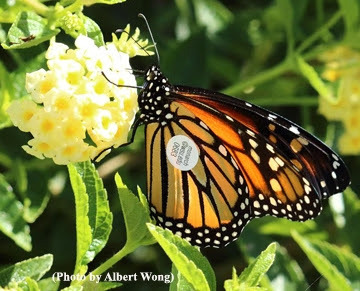 On Wednesday, Nov. 5, City Council members approved a request from the Pacific Grove Museum of Natural History for a pilot program to tag and sample monarch butterflies in the Pacific Grove Monarch Sanctuary. The one-time approval authorizes the Museum to tag approximately 2,000 monarchs, and sample them for the ophryocystis elektroscirrha (OE) parasite, as part of its Monarch Citizens Science program, later this month. The effort provides college students and adult volunteers with monarch education, as well as field research training. The Museum currently offers citizen science programs, public interpretation, and monarch education in Pacific Grove’s Monarch Sanctuary. Besides the Museum’s instructional component, collected data will also be shared with Cal Poly San Luis Obispo’s Monarch Alert program and the University of Georgia’s Monarch Health Lab to further understand western monarch overwintering sites and OE parasite infection rates. Monarch tagging involves placing a small sticker on a butterfly’s wing. Tagging 2,000 monarchs constitutes a statistically representative sample size. Researchers plan to use the collected data to monitor monarch movement between overwintering sites, and to better understand their eastern migration. Tagging is also planned for areas in Big Sur and Andrew Molera State Park. OE parasite testing samples will be sent to the Monarch Health Lab at the University of Georgia for analysis. According to prior research, 30 percent of the western monarch population is infected with the parasite. “We’re thrilled to contribute to better scientific understanding of our monarch population while engaging the public in hands on scientific opportunities,” said Museum Education Manager Ann Wasser. For more information on the monarchs, visit the Museum’s website at http://www.pgmuseum.org/monarch-viewing/.